Order your own copy of Children of the Empire at your local retailer or online through our website today! Though every clan produces skilled warriors, few place as much significance on the art of dueling as the Crane and the Dragon. With years of training, duelists from these Great Clans hone a steady hand, one that is capable of cutting down all who dare challenge them. 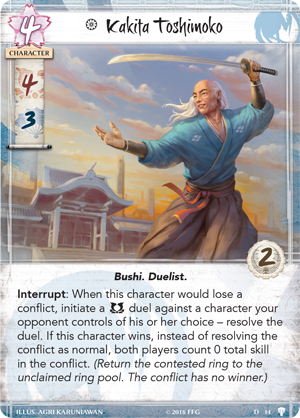 Join us today as we preview dueling in Children of the Empire through the lens of the Crane and Dragon! 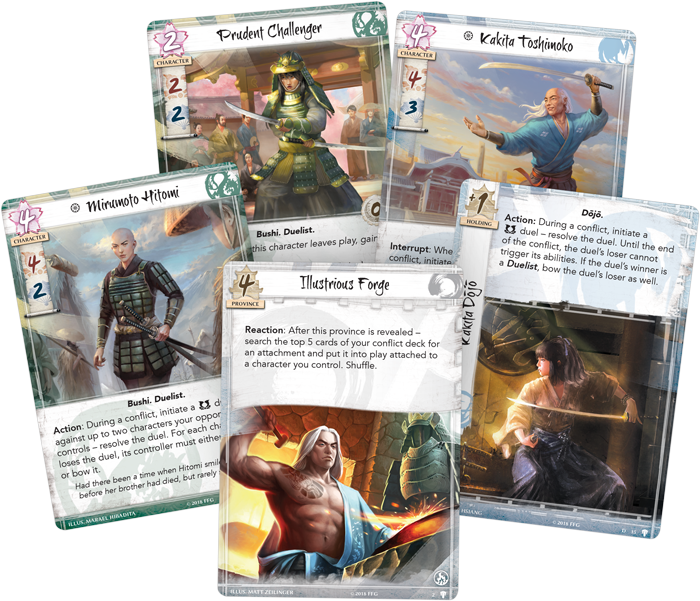 Children of the Empire is Legend of the Five Rings: The Card Game's first Premium Expansion, featuring a massive influx of 234 cards (three copies each of 76 cards and one copy each of six cards) spread across all seven Great Clans, making Children of the Empire the perfect next-step for new players and veterans alike. Through two very different styles, the Dragon and Crane are renowned for producing the best duelists in the Emerald Empire. 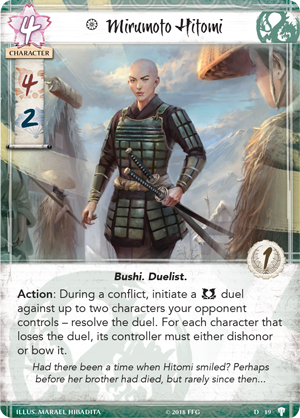 As Children of the Empire is a celebration of the land of Rokugan, honoring the legacy of these clans' legendary duelists is of the utmost importance, and both the Dragon and Crane receive plenty of support for duels in this Premium Expansion. Even against great odds, the Crane can find victory through skill alone. Kakita Toshimoko (Children of the Empire, 14) is one of the most prolific duelists in the world, and can single-handedly salvage what would otherwise be an overwhelming defeat. 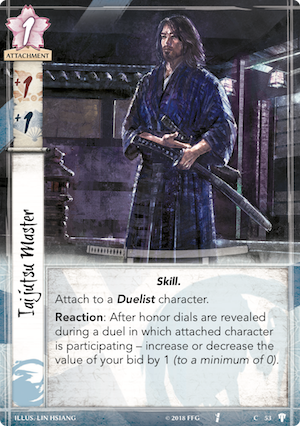 When the Crane would lose a conflict this Duelist is participating in, Kakita Toshimoko can challenge your opponent to a military duel—and should he win, the conflict ends in a wash, with all participants returning home and no victor! 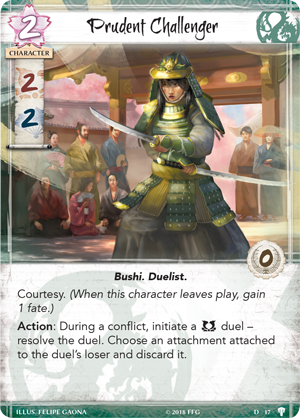 Toshimoko can already lend a great deal of military and political skill to a conflict, and this single Duelist can often prevent an overwhelming defeat for the Crane. Kakita Toshimoko represents the height of Crane dueling, but it is the journey of a lifetime to reach that level of skill. The Kakita Dōjō (Children of the Empire, 15) is where young duelists go to hone their skills and learn this sacred art. While this holding is in play, you may initiate a military duel during a conflict, with the losing character unable to trigger their abilities for the rest of the conflict. This is powerful on its own, but if the Kakita Dōjō training is applied to a Duelist, victory also bows the losing character, making them truly useless during a conflict. 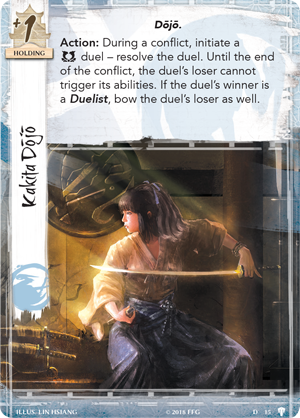 The Kakita Dōjō provides a new obstacle for your opponent to consider—if they cannot best a duelist in a one-on-one fight, they are likely to lose their most essential characters during a conflict. Of course, these abilities are useless if your opponent’s skill is insurmountable. However, with the ability of an Iaijutsu Master, you can often ensure victory. Not only does this attachment provide additional military and political skill, but it can add precision to your duels. Whether it’s giving the edge you need to achieve victory or winning with minimal loss of honor, the skill of an Iaijutsu Master is undeniable. There are those in the Emerald Empire that would dispute the claim that the Crane are masters of the duel. With their twin-blade Mirumoto style, the Dragon are just as fearsome and skilled, and they have their own methods to achieve victory. The Prudent Challenger (Children of the Empire, 17) is the Dragon’s representative among the "Challenger" Duelists in Children of the Empire, and it can be devastating to your opponent. With a win during a military duel, you may discard any attachment attached to the loser. This is a powerful reward, but victory may be challenging. Attachments often buff military or political skills, which can make duels difficult to win for the Prudent Challenger. However, should the Challenger’s training lead to victory, discarding an important attachment can disrupt your opponent’s game plan. Like the Crane, the Dragon must always focus on training the next generation of Duelists, to ensure their legacy continues. 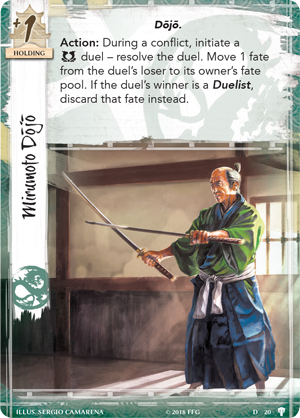 The Mirumoto Dōjō (Children of the Empire, 20) allows you to initiate a military duel with high stakes: the loser has one fate removed from them. There is some solace in defeat, as the removed fate goes to the loser’s fate pool. But if a trained Duelist has claimed victory, the fate simply disappears, as the skill of the Dragon overwhelms their foe and inflicts a defeat that cannot be recovered from. While the Prudent Challenger represents a new generation of Mirumoto-style dueling, the Dragon boast plenty of masters in the field. Mirumoto Hitomi (Children of the Empire, 19) takes on all challengers with her twin blades, able to initiate a military duel against two different characters. These characters add their skill together against Hitomi for one massive battle, and every character who loses the duel must either bow or become dishonored. The Mirumoto style of dueling has several advantages, and the ability to fend off multiple enemies is one of them. Hitomi can devastate your opponent’s forces, either by negating their skill in a conflict or reducing it through dishonor. 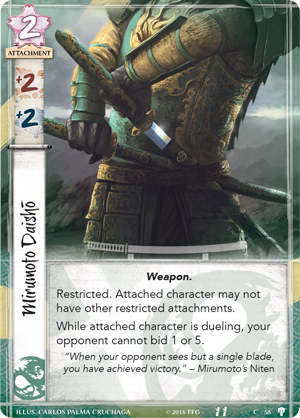 By choosing your opponents carefully, Hitomi can be a difficult foe for even two characters to defeat in a duel and with attachments like Mirumoto Daishō (Children of the Empire, 58), she can become near unbeatable. Every clan can produce an army on the field of battle, but none place as much significance on individual skill as the Crane and Dragon. These duelists are terrifying opponents, using years of training to hone their talents into an unquivering blade that strikes through any opponent. Will you stand among these renowned samurai? 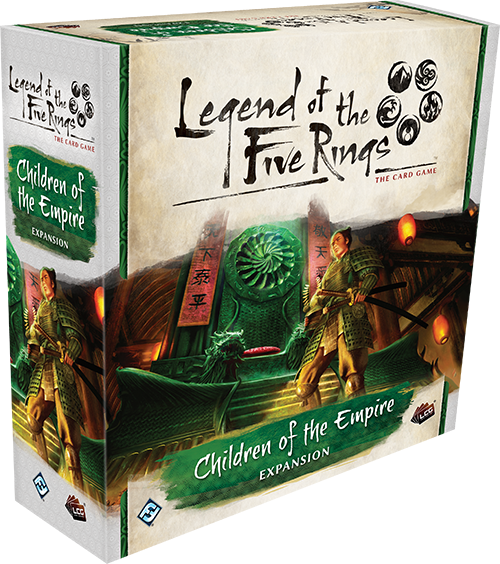 Celebrate the Emerald Empire with Children of the Empire (L5C16), available now for pre-order from your local retailer or our website!